Like all gardeners should, I welcome pollinators to my garden. The more bees I see around the flowers, the better I feel about the garden, and life in general. I never worry that a bee will sting me, and so far, they haven't. But I have been stung by relatives of the bees. There was the unfortunate paper wasp incident of 2006 and then the attack of the German yellow jackets last fall. So, here it is 2008 and I have another stinging insect situation to contend with. Around a star magnolia planted next to the house on one corner, there seem to be dozens if not hundreds of flying insects with stingers. I've stood from a safe distance watching them, and to me they look like mud daubers. But when I read about mud daubers, they are described as solitary wasps. So if they are solitary wasps, why would so many of them be flying in and around the star magnolia together? I keep trying to look inside the tree to see if I see a hornet's nest, but so far, I don't see anything like that. So I've decided the only way to make a positive id and determine if I have a problem, is to capture one of these wasp things so I can take a good look at it, and maybe take it to a county extension agent to look at. All I need is a jar and I know I can reach up and grab one it, just like when I used to catch fireflies as a kid. But when I mention this plan to others, they admonish me by saying "you'll get stung" or "haven't you been stung enough". Don't they think I've learned my lesson and will be careful? I even tried to borrow an insect net from my nephews and niece and was informed by my ten year old niece that they didn't have one and they don't try to catch flying insects. Hmmm. Wonder why? I thought for sure I'd given them an insect net once as a gift? Was she deliberately keeping it from me? But having no net won't stop me. Because I have to walk right by this star magnolia to mow the lawn, I really do want to find out what these wasps are. At this point, you are probably expecting this post to end with the story of me getting stung trying to get one of these wasp into a jar. No, I'm fine. It rained this evening so I couldn't go through with my plan. But I have a jar, and I'm just waiting for my opportunity. Wish me luck! Oh Carol! I wish you luck...you'd better read up on how to treat stings so you'll be ready...just in case. I got stung by a bee last week...the first time I'd been stung in over 40 years...although now that I really think of it it is over 50 years...it hurt WAY more than I thought it would and I luckily got the stinger out within seconds so it wasn't as bad as it could have been. My yard is full of various bees and they are really non-aggressive, but when you put your hand right down on one it stings :) Maybe have ice ready...not to be too pessimistic! Carol, I was hoping to get some of that rain today. It totally bypassed us. Yesterday's rain missed us too. I really should have watered tonight. Can you catch one with the camera instead of the jar? It might bee safer! OMG, this seems like a bad idea. At least have a friend or relative come over and stand by with the phone ready to call 911 in case they swarm. Bee careful Carol. If there are many in one place they are building a nest. Most are most protective of their nest. We had some kind of waspy thing that built a nest in the ground by a burning bush one year. I didn't know that waspy types did this. I didn't even pull weeds around that hole. Carol, your niece was probably just trying to protect you from getting stung. But you asked the wrong kid - you asked the one with a fear of bees and all insects that fly and have the ability to sting. Should have asked the oldest...he would have told you right where the net is...in the shed. Be careful when you go for it, and make sure you have a witness to call 911 in case you are attacked by a swarm..... (not kidding). Thanks for the smile this morning... You have your jar ready! And on a serious note...take photos for identification! Borrow a zoom lens camera if you have to. just as an aside: For the most part wasps really are useful...they eat the bad bugs! I catch and release them when caught inside. But one at a time is different then dozens in flying formation. If you get a wasps wings wet it won't be able to fly. So try hosing one down and while it's struggling on the ground, clap a jar over it and then wiggle a sheet of paper underneath to capture it. I took down all the paper wasp nests before your visit at Spring Fling. But since then they've rebuilt in their favorite spots just above each door. A utility worker came by the other day to explain the construction on my street and I wondered why he wouldn't come to the door to talk to me. "Lady! Watch out! There's wasps." I looked up and laughed. "Oh, yeah. That's my organic burglar deterrent system." Carol, if you have a Dollar Tree near you, they have insect nets for ... you guessed it, a dollar! I bought one last week to scoop debris from the pond. I hope you can deal with whatever these buggers are successfully AND uneventfully! As I was posting my comment, I spotted your weather widget: 70 degrees????????????? My net and I are on our way there right now! Carol, please please please use a zoom lens!!! I ran over a yellowjacket nest last year with the lawnmower and it literally scared me away the rest of the summer!! (I know, probably a little too dramatic, but I was SCARED!! those suckers hurt!!) I've only recently found your blog and I love it, so please no daring bug adventures that could harm your typing fingers!! Yellow jackets are my nemesis - I've been stung two or three times, and it HURTS, and it is such an unpleasant and, somehow UNreasonable surprise. I wasn't bothering them, I think!Good luck! The paper wasps are the worst for me. As I garden without gloves I have had a few stings from them. My whole hand swells up and continues up the arm. 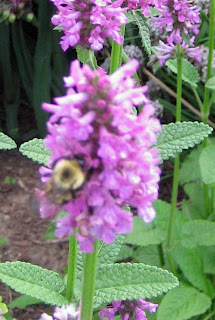 The bees never seem to bother me as I work in the plants. Mud daubers are annoying but they are the good guys as they gather up insects for their hatching young. Last weekend I worked all day in the garden and then while drying my hair was stung by the hugest, meanest, most painful wasp! It hurt for hours! I need to get some meat temderizer, I hear that helps so you might want to stock up! How about one of those smokers? Good luck! Another vote here for a camera with a zoom lens! I mean, you could just go get some of that wasp spray that jets out ten feet (to keep you from being stung), but what if they're relatively harmless and would benefit your garden? carol - i have this awesome image in my head of you with a net chasing wasps. you are stubborn, carol! I am most appreciative of all the great advice and the care and concern that I not end up with a swarm of stinging insects chasing me around the garden. So, I went out with my camera this evening to take some pictures, and there were far fewer wasps hanging around the magnolia. I did see some mud daubers, a few yellow jackets, many flies and a few other insects. The problem, as it turns out, is that the magnolia is infested with magnolia scale, which is secreting a sugary sap, which is in turn attracting all the bees, wasps and flies. The cure is to get rid of the scale. I thought I had gotten rid of it last fall, but it is back. The research I did indicates I should spray with a summer oil spray in August, and then through the fall to kill the scale when they are moving. But I might spray now, anyway. I don't think it will hurt the plant and it might slow the scale down. This is a magnificent tree when it is in flower, so I want to save it from the scale! Oh wow, Carol, I am SO glad you solved the puzzle, and that you don't have a wildly extra-large swarm of hornets setting up housekeeping in your tree! I can't believe I am reading this-as I was stung by a paper wasp in the garden today! i don't particularly mind, as wasp and bee stings have been used since ancient times in Chinese, Greek and oriental medicine-so once one is not allergic I think the old adage what doesn't kill makes you stronger applies! I definitely felt a surge in energy the week after my last bout of stings. So do some people undergoing bee venom therapy. Carol - they will send a message to send their friends after you -- don't do it! You evoked an OLD memory for me - making a home made net for an insect science project at school in the 5th grade with a blue stocking of my mother's and a coat hanger. I could just see you flitting about the yard with such an implement. Steer clear!